You create pages using an interactive tree view called a site map in the Pages panel. By default, every new ProtoShare project includes several default pages. The Home page is at the top of the tree and constitutes the root page. If you have Developer privileges or better, you can create additional pages. All new pages are located below the root page. The location of the new page is based on the current selection. You can change the location by dragging the page in the site map. 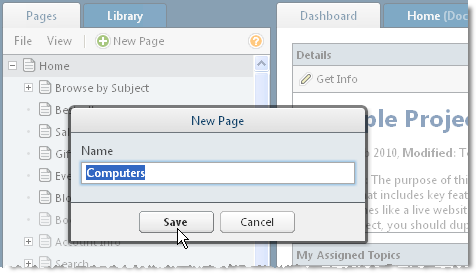 Create a new sibling page or a new subpage using the New Page button, the right-click context menu, or the keyboard shortcut. Each new page has a default design, which contains no content. To add content to the design, you open it in the Editor and add components or Library items. Click the Save button or press the Return Key. The Pages panel is shown below with the root page selected. A new page named Computers will be created below the root page.